Everyone knows how important blogging is and so in the new Showit Web PRO we made it easier to post shows to your blog by allowing you to resize the show after it's created! So if you wanted you could upload a show full size for your clients to view and then resize the show and save it your "blogslideshow" folder as a new size to fit your blog. Hi DJ. I started visiting here a month ago. Over the past year, your name would be mentioned every now and then in your friends' photography blogs. So I finally visited your blog, and you seem like a cool person. Anyway, is that a song in that slideshow by Deliriou5? I recognize the tune, even though it's instrumental. Jules - that song is a 30 second version of "Windshield Wipers" by T.J. Hill. It comes with showit web. T.J. Hill also sells his music through his own store here: http://tjhillmusic.com/store/catalog/product_info.php?cPath=25∏ucts_id=46 (hope DJ doesn't mind the link). I saw that part of the new Showit and was wondering how I save it to a different folder. I'm a bit confused. Right on! Yea that song is great..and so is TJ Hill! I think he'll even make custom stuff for you so hit him up! 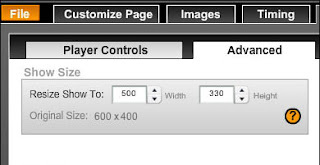 Yea...just resize the show...save it and then upload it to a new place on your site so it doesn't copy over the old show! I swear, it still sounds like a song by Deliriou5....maybe both songs have the same chords or something. :D Thanks. Hi DJ! I love Showit web and am excitd to share it with our clients. However, I am struggling to get it on our blog and for that matter our website. I feel like I have followed all directions, but am still unable to get it on the web. Any suggestions would be appreciated. Thanks so much!